Bolton's El-Hadji Diouf has been banned for three matches with immediate effect by the Football Association after admitting a charge of improper conduct. The striker was charged after he spat at Arjan de Zeeuw during Saturday's defeat against Portsmouth. 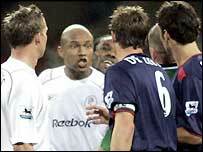 Bolton fined Diouf a maximum of two weeks wages on Sunday and could send him to a psychological counsellor. The Senegal international has now been in trouble with the authorities over spitting on three occasions. While at Liverpool, Diouf was fined £5,000 by the Glasgow Sheriff Court for spitting at a Celtic fan during a Uefa Cup game. And Cleveland police launched an investigation earlier in November after Diouf was accused of spitting at a Middlesbrough fan. Bolton manager Sam Allardyce said the club hoped to help Diouf. "We have discussed the situation at great length. El-Hadji is full of remorse and very sorry for his actions," he told Bolton's website on Tuesday. "He has apologised and has accepted his punishment, both from the club and the FA. "We will deal with his problem in the long-term. He will get help from our in-house team. We have all the necessary expertise to deal with his problem internally rather than outsourcing professional counselling." Diouf, who will miss the away matches at Everton on 4 December and Norwich City on 11 December, as well as the home game with Manchester City 18 December, has issued a public apology to De Zeeuw. "My behaviour showed a lack of moral responsibility to the public who support me and I'm deeply sorry," he said. A joint statement from chairman Phil Gartside and Allardyce said: "The club does not tolerate such behaviour from its players." The statement, published on the club's official website, continued: "We had no alternative but to evoke the maximum fine against El-Hadji Diouf. "Bolton Wanderers takes great pride in its very proactive family image and yesterday's incident has left a sour taste. "We do not condone the actions taken by the player and for that he has been severely punished." The incident happened in the second half of Bolton's 1-0 defeat at home to Pompey, a game in which De Zeeuw scored the only goal. "I was a bit stunned at first. I thought 'I can't believe this'," De Zeeuw said. "But we were leading 1-0 and I was not going to get sent off for it even though I felt like punching him in the face. "This shouldn't happen. It is unsportsmanlike, ridiculous and cowardly. "You would think after once he would have learned from it but apparently not. I am just very disappointed with him." Bolton midfielder Gary Speed joined in the criticism of his team-mate. "It's something that you can't defend," Speed said on BBC Radio Five Live. "The pictures were there for all to see. It's not a nice thing to do. "To be on the receiving end of that is probably the worst thing that can happen to you. "It's something that nobody wants to see in football and I'm not going to sit here and try and defend it."